I also have a pattern that irks me in the Sew Chic Kid’s book. It’s the Pull Over Parker that You and Mie and Elsie Marley jointly hosted a sew-a-long for recently – check out all the wonderful variations in their flickr pool. So what irks me about this pattern? Well, I just can’t get my head around when you’d want to wear a 3/4 length sleeved light weight woven top with a hood. It seems neither one thing or the other. At some point, these two thoughts melded and I thought I could adapt the pattern to make a fleecey top replacement, and maybe one for sister as well. I had half a mind to join in the sew-a-long and make a headstart on some sewing for Christmas but that never happened. I looked to see if anyone in the sew-a-long had made one in fleece to see how it went, but apparently not. So I sat on the idea some more. 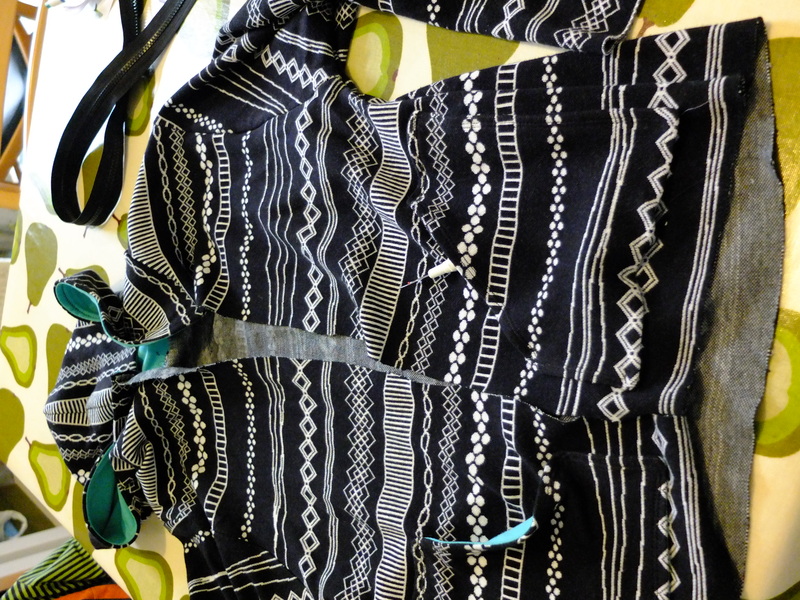 And then I came across this funky geometric sweater knit fabric by Kitschy Koo. It’s perfect for the boy. He is a lover of all things bright and patterned – I think in part due to his fairly severely colour deficient vision. This ticks the geometric box big time and might help tone down the brightness on some of his outfits. So, I had an idea (replacement snuggle hoodie), I had sourced the fabric and I had a pattern in mind. Then I decided it was the wrong pattern. It was a combination of the neckline elastic detail, which I wasn’t sure about (and surely wasn’t needed for a stretchy knit fabric, but I also wasn’t sure how to change it) and how to finish the sleeves once I’d extended them to full length, I thought I’d get away with it in fleece but I’d know chosen a knit fabric – plus someone had commented the hood was small, indeed I found that when I hacked this pattern hood for nativity spiders and wolf costumes. 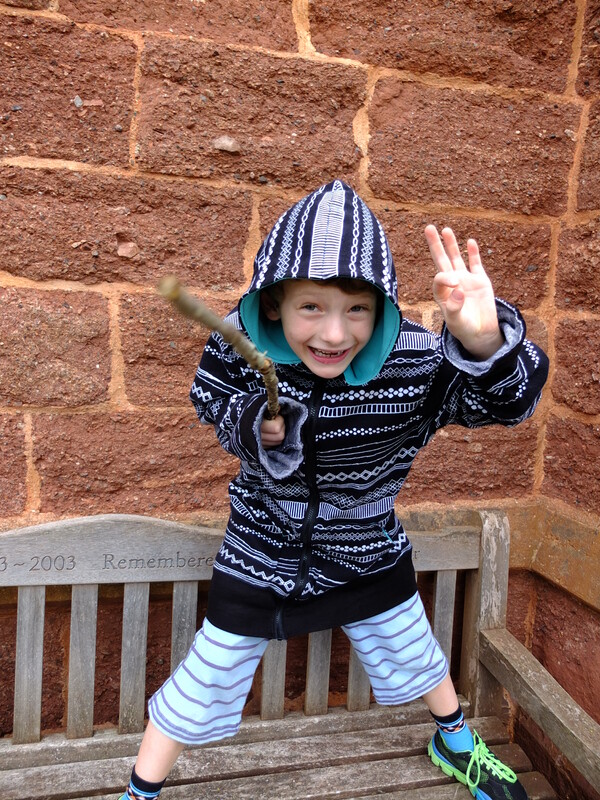 And so began the hunt for a boys hooded sweater pattern – I figured I could make up the kangaroo pouch detail. But I couldn’t find one. I changed my search terms, but I still couldn’t find what I was looking for (although I did discover that in the USA pullover seems to mean a dress for small girls, rather than a jumper/sweater). 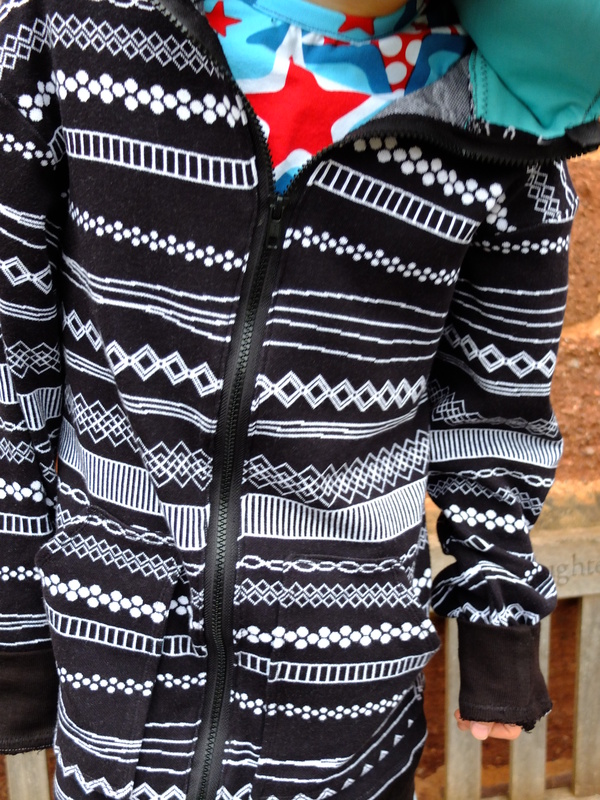 I kept coming back to a free zip up hoodie pattern from The Boy Trifecta. It wasn’t quite what I wanted as it had a zip and I wasn’t feeling up to working out how to change the neckline/hood if I left that out. But it kept popping up in the search terms. Maybe a zip isn’t so bad I thought. But then I can’t have a kangaroo pocket. A half zip maybe? How to do that? Finally it dawned on me, half kangaroo pockets. Right, deal, order the fabric (got a little carried away there), try and print pattern, several times, finally get printer to work, print it again at 100% rather than 70%, get ill, be busy, lose the pattern, print it again, breathe and start. After all that faffing, most of the actual make was pretty straight forward and came together very quickly. I had a couple of dips in confidence at first. The fabric when it came looked more knitted and less sweaterey than I imagined. It’s described as a sweater knit, which I thought meant it was sweatshirt type fabric that was technically knitted, whereas it looks and feels obviously more knitted than that. Indeed hubby commented when I was half way through the make that I looked like I was making him a cardy and I know what he means. However, the fabric has grown on me (and I must say there is nothing at all wrong with it, it’s great quality, just I’m a little inexperienced at understanding fabric descriptions) even if it is a long way from the snuggly qualities I originally had in mine. The other minor wobble came when I printed the pattern – I was surprised to see a clearly hand drawn line marking our the one sized pattern. Also it didn’t have page match up markers, so all in all it didn’t look as professional as the patterns I’m used to printing off (free or paid for) and I was worried about cutting into my expensive quality fabric on the strength of it. 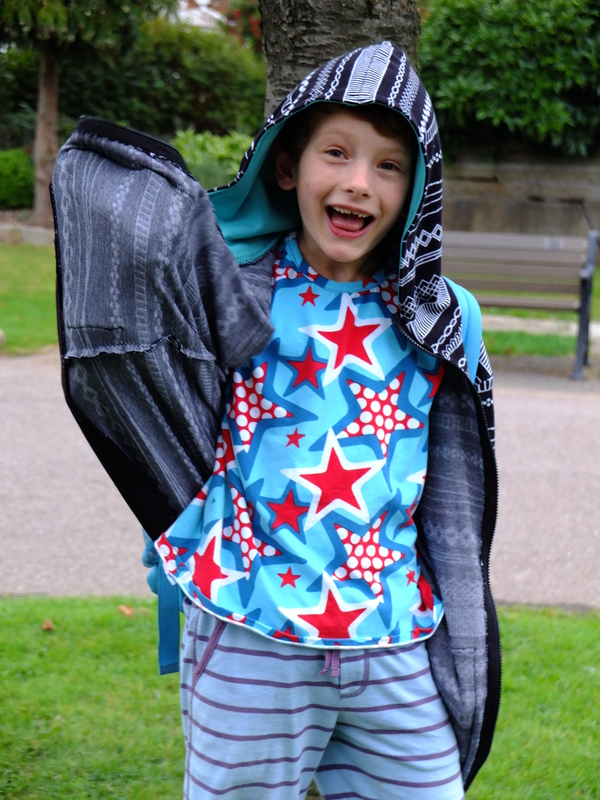 But I gave myself a stern talking to about my prejudices, after all it’s a free pattern, which is very generous, and it has clearly been used by Emma to make a fantastic looking hoodie. Plus how is a Computer Aided Design package style line on a pattern any more or less accurate than a handdrawn one – it’s the skill of the pattern designer that counts and I certainly can’t judge that by glancing at the pattern. When I came to piece the pattern pieces together I found it no harder than a “normal” pdf to match up – in fact it was on the easy side, once I’d worked out what was going on with the hood shape. 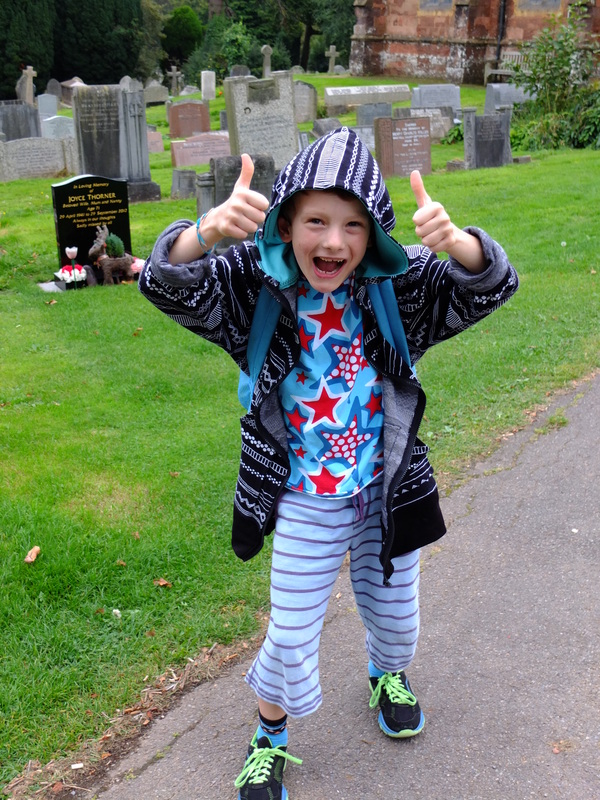 Next off I compared it to a top he already has for a size adjustment, as the pattern is for “a tall 9 year old” and is “comfortable a size 12” (which I didn’t spot at the time, I just went with the 9 year old bit) and my lanky son had just turned 8. The width seemed pretty comparable, a bit baggier, but the length was huge. So I randomly on a whim scientifically measured and calculated took about 3 inches off the overall length and an inch and a half of the sleeves. 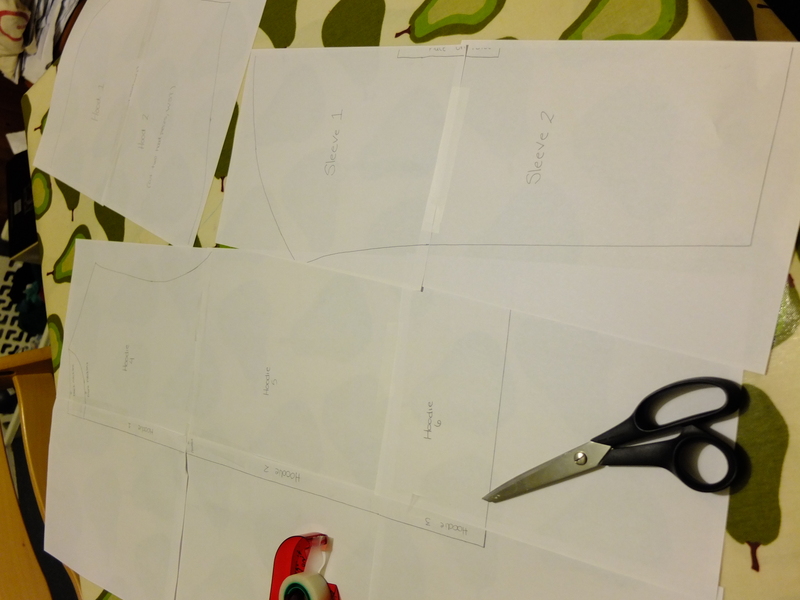 And then I cut out a half kangaroo pocket (surely that’s not the correct term) pattern piece, I was going to copy the one on little sisters onsie, but she was snuggled up in bed asleep in it, so I did more impulsive guesswork careful measuring out. 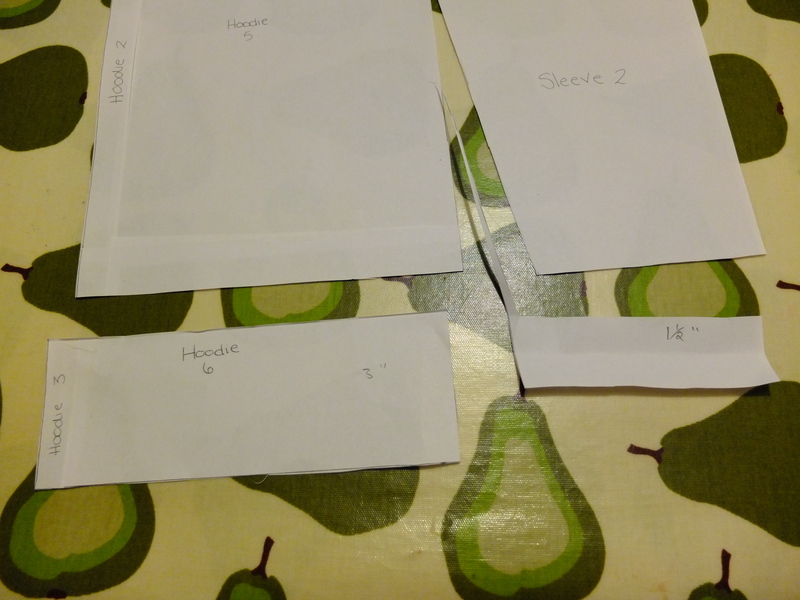 Right, pattern pieces sorted, onto cutting the fabric. I found pattern matching on this fabric so very hard as it has a really obvious horizontal stripe of different designs, but some of them are wavy so they don’t always match up or have the same distance between them. Arghh. But I got it good enough I think. The fabric is 160cm wide. I think I would have got either a hood or the sleeves out of the same width as the front and back pieces if it wasn’t for pattern matching. As it was I glad I bought a metre and a half, just a metre and there would’ve been tears. Plus I have a biggish piece left. For the hood lining I used some mint plain organic jersey that I had randomly bought from Kitschy Koo. I had completely forgotten to get hood lining when impulsively splurging buying fabric for the hoodie but had ordered 1/2 m of a smokey blue jersey – thinking of something for me (not sure what from that little fabric??) but then I had a lovely email apologising that they were out of it, so I picked the mint green instead. I had looked at the mint green when ordering, but was put off by the description of it as mint, which was a greener green in my head than the colour I saw on screen. Luckily when it came it was actually a bluer, kind of pale turquoisey green, which I love and is more like it appeared on screen. Also it handily looks good with the sweatshirt knit whilst still being subtle. I cut pocket linings from it too. I kind of wish I had enough to line the entire hoodie with it, but it was already pretty expensive (I don’t want to add up how much, more than I would spend on one new in the shops). The sewing up started of well. 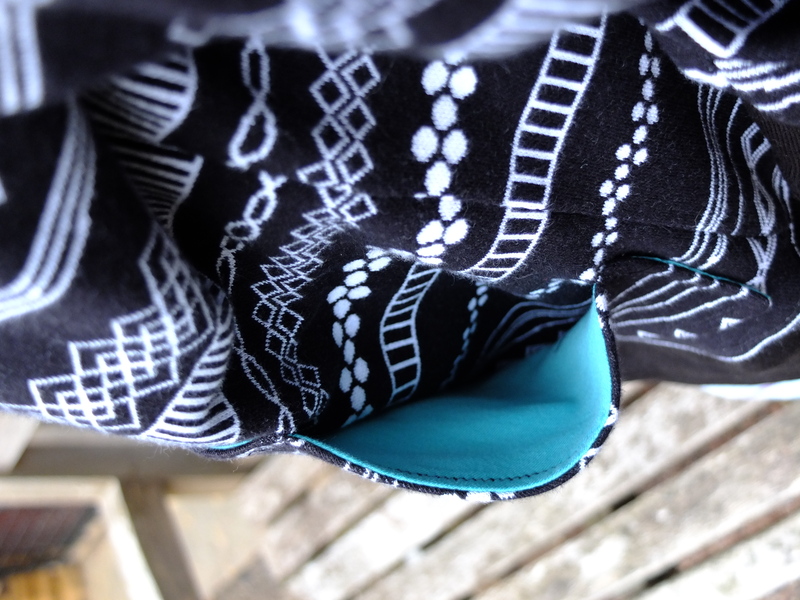 I made the pocket’s first, bagging them out and then sewing them with twin needle to the main body – which took a bit of tweaking to get the patterns to match “well enough” (they’re not perfect now but they don’t scream at me). 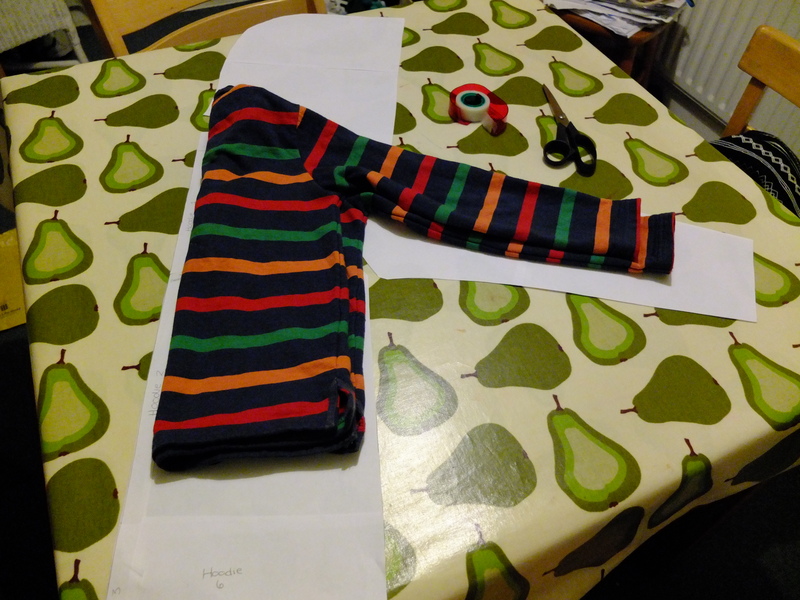 Then I nearly sewed the fronts on the wrong way round, I realised just in time. The reason for getting them mixed up was because I’d sewn the pockets on the wrong sides, so they opened in the middle not at the edge. Grr. I must confess I left them for a while and did some more hoodie construction before unpicking them because I was so cheesed off so I could use natural light. The instructions didn’t mention a seam allowance that I could find, I assumed one was included in the pattern and used 3/8″ throughout (as I prefer using a smaller seam allowances to a larger ones that then needs trimming – due to my laziness. Plus lining up the edge the fabric with the edge of my presser foot handily gives a 3/8 seam allowance). I also tried a wide zig zag stitch (being fed up with the triple stretch stitch and the unitdy look it gives and how hard it is to unpick) and it worked fine. I was working on the assumption that knit fabric doesn’t need finishing because it doesn’t fray, but it’s a looser weave (knot? stitch?) than a jersey and I’m starting to think I may have to go back over my seams and finish them off. Also, I topstitched down the seam allowance on the hood/main body seam to help it lie flat. I considered finishing it with twill tape but didn’t know how. I did remember to add a hanging hoop. Pretty soon I had a hoodie looking garment that just needed a zip adding. There isn’t much in the way of instructions with the pattern on zip adding, but I was confident as I’ve added many a zip to a Presido Purse/Bag. Oh silly, silly me. I have never made a bag from stetchy fabric. Adding a zip proved to be a nightmare. My zip was too long, I knew I would need to trim it, but no matter how I pinned it the excess was a different amount each side. So instead of leaving it, I decided sewing carefully up from the hem on each side would sort that out. It didn’t. It made a hot mess. This time I asked for help from the Stashbusting group and the general consensus was interfacing of some kind. I unpicked the zip whilst sat in the waiting room at the dentist (I was there to accompany my friend home). The next day I decided to loot my mum’s stash for double sided fusible interfacing type stuff (she had some bondaweb) whilst I was there. I scored some and contemplated ironing my zip in place with it. I couldn’t work out how to do it. 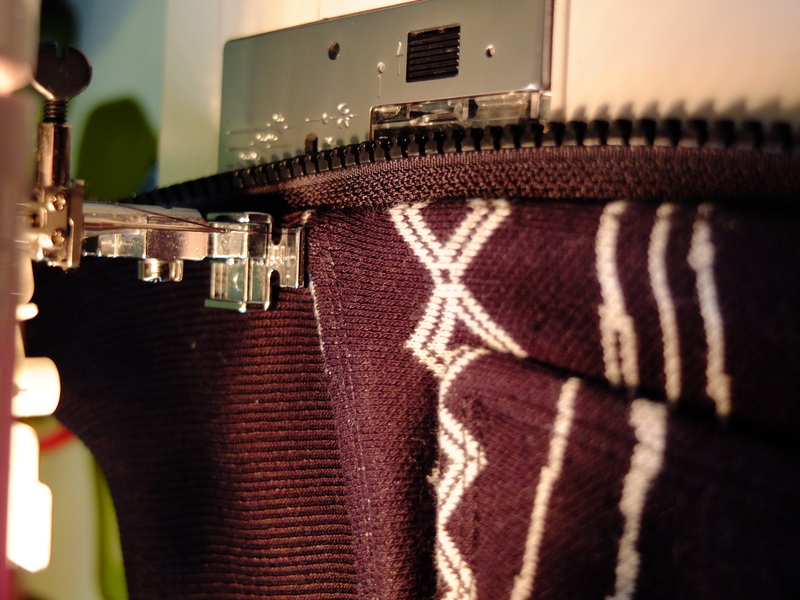 Then I tried pinning it in place first and I was back to the issues I had before pinning the zip in place. Then the inspiration struck me. I needed to tack it in place. Yes, tacking (a.k.a. basting), that we were always made to do at school and I’ve never done since. So, I tacked the zip in place. Slowly. A section at at time. Starting with the rib and working up. 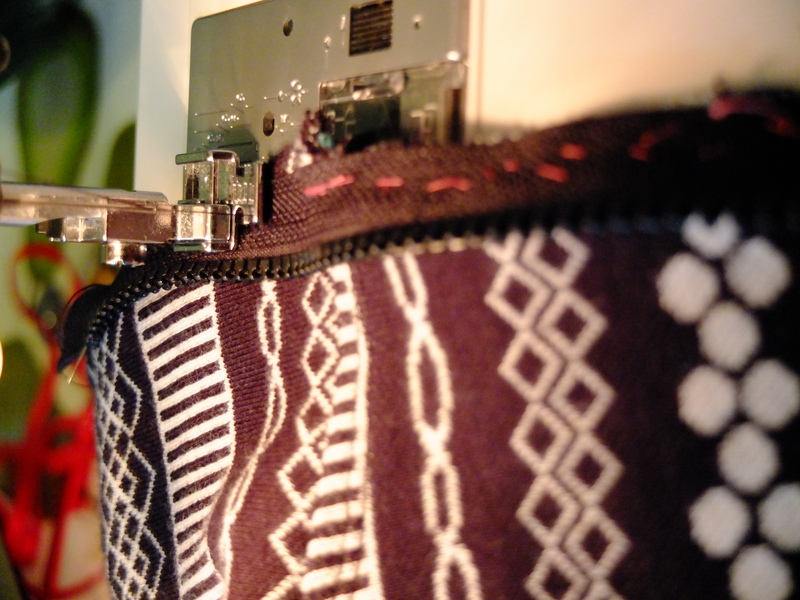 I would mark off on one side of the zip where it came at the top of that section, match the mark on the other side of the zip, pin both sides in place at the top of the section and then carefully tack that section on either side. Then I would zip it up, check it matched and go on to the next section. I didn’t use any fusible anything or any kind of interfacing. I had to persuade some of the sections to fit as I think one of the front pieces had stretched, but it worked. using my zipper foot to sew my pre tacked zip in place. (The zip is right side together with the fabric, teeth facing the wrong way at this point). 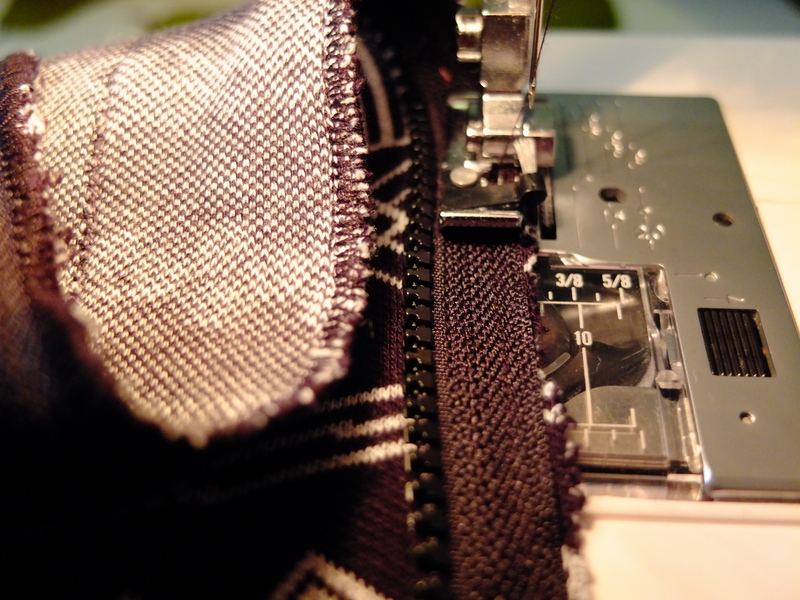 After that it was quite straightforward to sew the zip in place on my machine. Then unpick the tacking. Why didn’t I think of this sooner? (At least I didn’t buy expensive unnecessary sewing stuff I guess). I used my overlocker foot to finish as I was becoming paranoid about the fabric fraying, then I pressed the seam to set it, then I panicked that I shouldn’t have done and that doing so had damaged the zip (it hadn’t), then I turned the zip the right way round (with the teeth facing in towards the other zip), pressed and topstitched in place. In the end, I’m pretty pleased with how my zip came out. Oh I forget to mention the last minute design decision, I just extended the zip up the hood a little rather than trimming, which is fine as it’s absolutely huge on the boy. The length (from nape of neck to end of ribbing) is a whopping 26″, the width is 16 1/2″ (so 33″ circumfrence) and the length of the sleeve (from the shoulder seam down to the end of the cuffs) is nearly 23″ – and remember I cut about 3″ off the length and 1 1/2 inches of the sleeve length of the pattern. Luckily he likes it because it’s going to fit him for a while (should’ve read the age 12 bit!). Personally I’m really pleased with this one, thanks for the pattern Emma. And it was only a week late in the end. However, it’s not a snuggly fleece top, so I may have to think again on that one. Let me know if you’ve tried the pullover parker in fleece or have a better pattern suggestion. Hmm, I think this post has got ridiculously long, so should you have made it this far, feel free to skip the last couple of gratuitous shots.